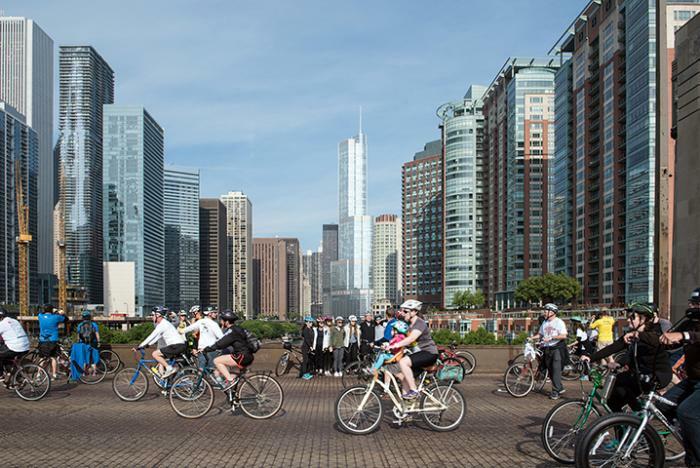 And true enough, cycling in Chicago has become all the rage in the last decade. Practically every street has either a shared or buffered bike lane, and there are several completely protected lanes separated from traffic (check out the bike lanes on Dearborn Avenue and Washington and Randolph Streets in the Loop). 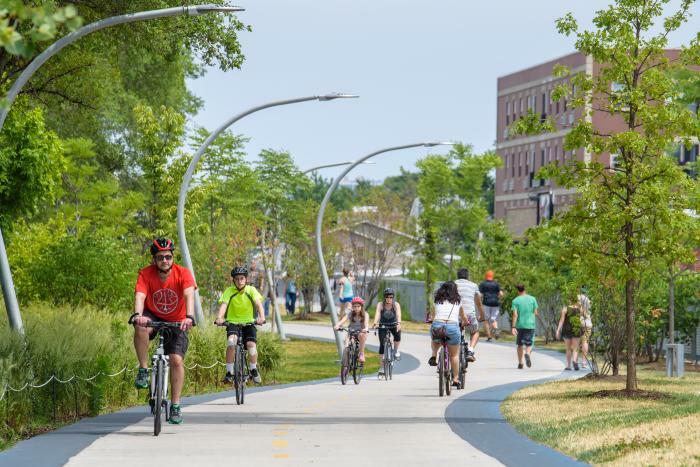 To me, there&apos;s simply no better way to see the city, particularly given all the urban trails tailor-made for cyclists, from The 606 to the Lakefront Trail. Looking for some cool rides and bicycling events? You&apos;ve come to the right place. Grab a Divvy bike, Chicago’s bike-share program with 580+ stations and 5,800 bikes across the city, and get pedaling. 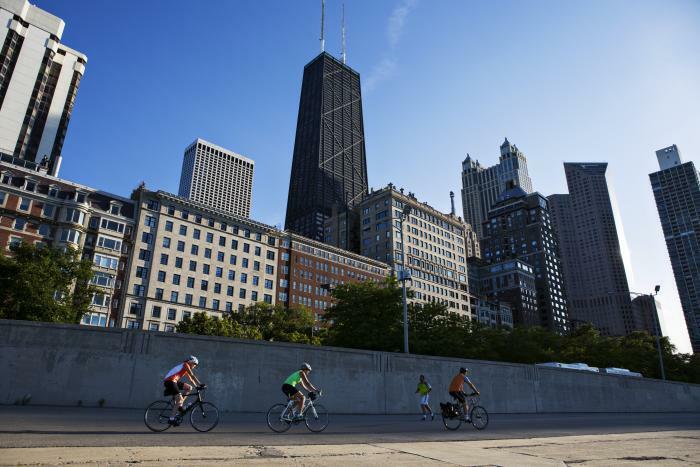 Every year, Lake Shore Drive, our scenic lakefront thoroughfare, closes down to vehicular traffic and becomes a cyclist’s paradise. Bike the Drive, which will be held on Sunday, May 27, attracts thousands of riders who cruise the entire 30-mile ride or start at various checkpoints for shorter distances. Here’s a tip: Bike the Drive participants staying at the Fairmont Chicago enjoy all kinds of extras, including 20-percent off valet car parking; easy access to the start/finish area, which is located less than 1 mile from the hotel; secure, indoor bike parking; complimentary continental breakfast the morning of Bike the Drive; 15 percent off all spa services; 24-hour fitness center access, and a whole lot more. Even when Bike the Drive isn’t in full swing, you can ride along the fantastic Lakefront Trail, with Lake Michigan to the east, and the city skyline to the west. The trail hugs the lakefront and runs for 18 miles all the way from the south side of the city to the north. It’s simply one of the best ways to experience the spirit of Chicago, passing harbors, the downtown area, iconic museums, a golf course, beaches, restaurants, public art and sculptures, historic community centers, a theater, and even a bird sanctuary. Plus, the creation of two adjacent lakefront paths to separate walkers from cyclists will be finished this year, making it even safer and easier to take in Chicago’s great urban outdoors. The unused elevated train line that once ran along Bloomingdale Avenue on the city’s west side is now a celebrated, elevated 2.7-mile bike, jogging and walking trail connecting the hip Wicker Park, Bucktown, Logan Square, and Humboldt Park neighborhoods. The multi-use park also features an observatory, art installations, educational programming, green space, and other amenities, not to mention special events, such as camping on the 606. Feeling a bit daring? Clothes weighing you down? On June 9, 2018 you can take part in Chicago’s 15th annual Naked Bike Ride. The free, clothing-optional ride attracts hundreds of riders in various stages of undress, and is held in cities around the world. Its mission is to help promote more cycling, as well as positive body image. Check-in for the ride begins at 6pm in the West Loop, with the ride usually running from 8pm-11pm. 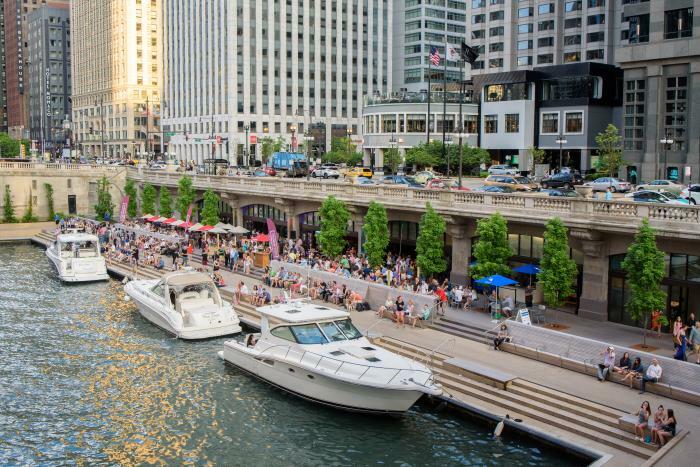 There’s so much to see and explore along the award-winning Chicago RiverWalk – from fishing and kayaking to river tours and dining. Another thing you can do is cycle the 1.25 mile path along the Main Branch of the Chicago River, and, in fact, there’s a Divvy station located nearby. This is a pedestrian area, however, so do make it a slow and casual ride, taking in the river views, the city skyline, and the hub of activity that makes this such a vibrant place to wile away the hours. If you want a real workout in the midst of nature, check out trails like the North Shore Channel Trail, which leads to the Skokie North Shore Sculpture Park, and the wonderful North Branch Trail. A new extension was completed last year, creating a non-stop trail from Foster Avenue all the way up to the Botanic Gardens in the suburb of Glencoe. It’s a gorgeous ride through the Cook County Forest Preserves, during which you might well spot deer, raccoons, birds of prey, and other wildlife. Join the North Branch Trail Alliance all along this trail for rides throughout the spring and summer. Next up, look out for the New 312RiverRun trail, which comprises three parks — Clark Park, California Park and Homer Park — connected by a single path that stretches for nearly 2 miles along the Chicago River, from Belmont to Montrose. The Riverview Bridge portion of the path will be a unique, 1,000-foot winding section that crosses the Chicago River, and will be completed by the end of 2018. The next phase, scheduled for 2019, will feature a pedestrian and bike path from California Park to Horner Park.